Tanya Aguiñiga, Community Felt-In, 2014. Photo by Jim Newberry, courtesy of the artist. The Center for Craft, Creativity & Design (CCCD) is pleased to announce Back to the Drawing Board, a new program series that provides six artists the opportunity to "take-over" CCCD's Benchspace Gallery & Workshop for a 24-hour period. Collaborators invited and juried from across the United States will produce installations, performances, and other experimental activities that invite the audience to participate in the creation of a final work of art. Back to the Drawing Board seeks to make the invisible creative process visible by providing a venue for experimentation, collaboration, failure, and innovation. "Craft extends beyond what may be placed on a pedestal," program curator and CCCD Assistant Director Marilyn Zapf states, "Back to the Drawing Board is designed to allow the viewer access to the often tumultuous creative process." Using media such as ceramics, glass, textiles, and book arts, the selected artists push the boundaries of what is or is not considered craft. The focus of these six projects ranges from environmental change and immigration to community empowerment and questioning domestic etiquette. The first project will be led by Los Angeles based designer and artist Tanya Aguiñiga. 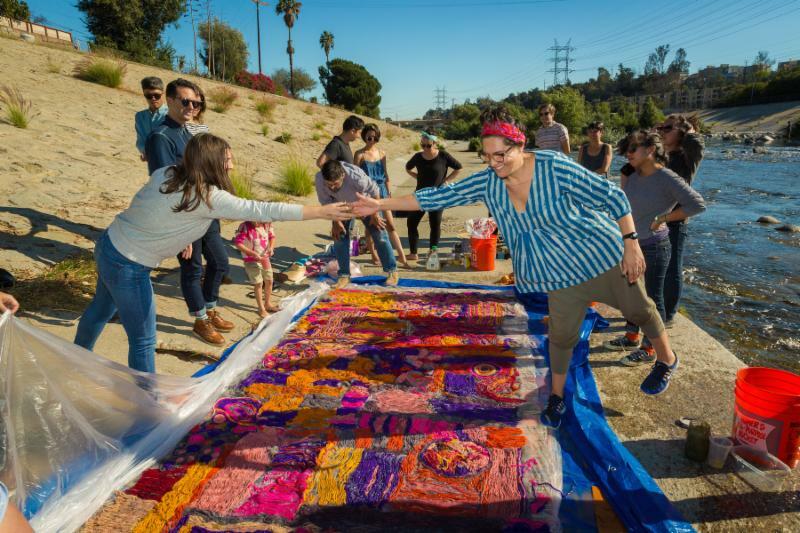 Performance Crafting: Hand in Hand will be the fourth craft based performance in an ongoing series where Aguiñiga deconstructs her own making process and ideas and applies them to public based explorations. During Hand in Hand, visitors will learn the wet felting techniques best known in Aguiñiga's furniture and product design, and apply it directly to bodies, experiencing the materiality of wool and creating a communal experience of making. Visitors will be invited to felt one another's arms by lightly massaging wool continuously around the hand and forearm area in order to build up a thick layer of wool. Once removed from the body, these hollow forms will be displayed in the gallery, marking the collective action of making through care for one another. The project aims to connect community members, teach new skills, engage visitors in the making of exhibited art, satisfy the need for human contact, while exposing individuals to contemporary craft. Back to the Drawing Board will consist of a series of four events beginning in April and culminating in August with a special event, featuring three artists simultaneously working in the gallery. Each project will begin with a public reception from 6 - 9 pm Friday evening and continue from 10 am - 6 pm Saturday. All events will be held at CCCD's Benchspace Gallery & Workshop, 67 Broadway Street, Asheville, NC and are free and open to the public. For more information, call 828-785-1357 or visit www.craftcreativitydesign.org. This program was made possible by the John & Robyn Horn Foundation and receives media sponsorship from Industrious Productions.